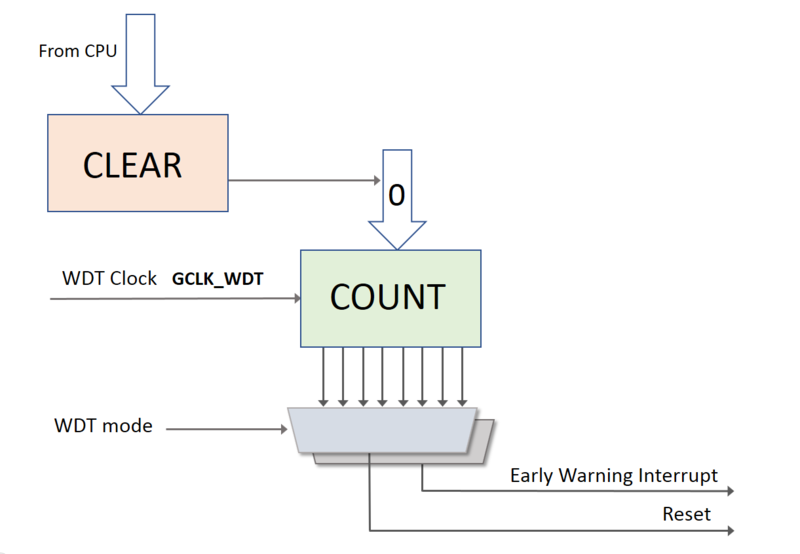 The Watch Dog Timer (WDT) allows a Cortex®-M0+ based microcontroller to recover from catastrophic software errors such as a run-away code or a deadlock condition. Once enabled, the WDT requires the application software to write a bit pattern to a WDT register within an allocated time period. If the WDT CLEAR register is not updated by the application within the allotted time, a system reset signal is generated. Reset occurs when the WDT is not reset within a certain time period. WDT operates on a clock source which is independent of the CPU. GCLK-WDT can be as low a 32 Khz. The timeout period can be up to 32,000 clock cycles (one second using 32 kHz clock source). WDT Can be programmed to initiate an early warning interrupt to alert the application of an imminent WDT overflow. Normal Mode - This mode requires the WDT to be reset anytime before the timeout period expires. Window Mode - This mode requires the WDT be reset within a specific time window. Both minimum and maximum reset periods are defined in the window mode.